In general, pig is a hog and a hog is a pig. The two terms can be used interchangeably for any adult of Sus scrofa domestica, the familiar barnyard animal. In the animal world, special words often are used to describe gender, age and reproductive status. Baby swine are called piglets until they are weaned, regardless of gender. An immature weaned female is a gilt, while a male is a shoat. Once a gilt has had her first litter, she becomes a sow. A neutered adult male is a barrow, and an intact adult male is a boar. Like horses and cattle, pigs came to the New World with Columbus. They originated in Southeast Asia, and are thought to have been domesticated about the same time as sheep, goats and cattle: 11,000 to 9,000 BCE. Sheep, goats and cattle were more popular with nomadic peoples because they instinctively mass together and are herded easily. Swine, on the other hand, were managed more easily by settled folk, because pigs hang in family groups and herding them is a lot like herding cats. The old expression "independent as a hog on ice" means a hog is determined to go his own way, even when he's not entirely sure which way that is, just so it's not the way you want him to go. Once free, hogs revert to the wild with almost magical speed. They change physically and in temperament. Feral hogs in Arkansas are known as "razorbacks" because over time their roly-poly bodies change to a leaner, meaner physique with a prominent ridge along the back. They also change their disposition to become wilier and more aggressive. Wild pigs breed rapidly and are now found in all but 14 of the 50 states. They have become a serious nuisance in many areas of the South and Midwest, causing millions of damage to crops and farmland. They are increasingly a popular quarry for hunters. One of the reasons feral swine have been so successful in the United States is that there were no native swine to compete with them. The closest thing on the North American continent was, and still is, the collared peccary (Tayassu tajacu), which is pig-like, but not a true pig. Their range covers only Arizona, New Mexico and southern Texas, so the gone-wild pigs have had lots of room and no competition. 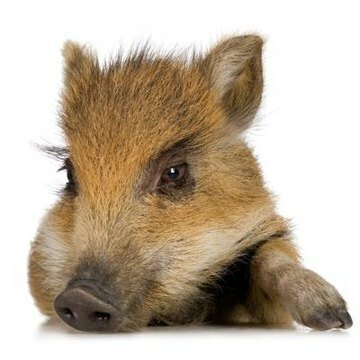 Feral hogs sometimes are referred to mistakenly as "wild boar," but that term should be reserved for the real deal -- the Russian or European boar. This big, black, long-tusked bruiser is the ancestor of the pig in the pen, but also can become his future, as boars once imported to special hunting ranches have increased the percentage of true wild blood in the feral stock. A Discovery Channel video, called "The Pig Bomb," emphasizes just how serious this problem has the potential to become.